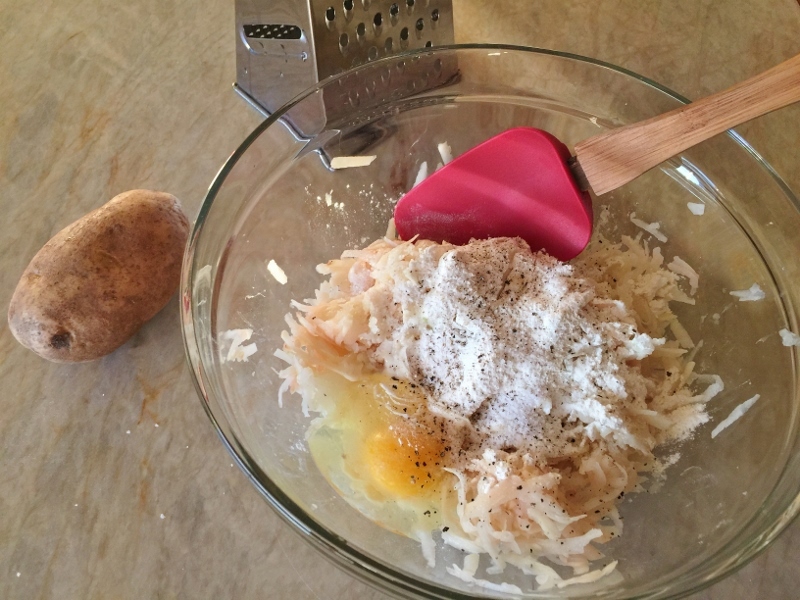 Latkes - Recipe! - Live. Love. Laugh. Food. Hanukkah is the Festival of Lights and there are eight days of celebration with gift giving and enjoying foods cooked in oil to commemorate the re-dedication of the Holy Temple. 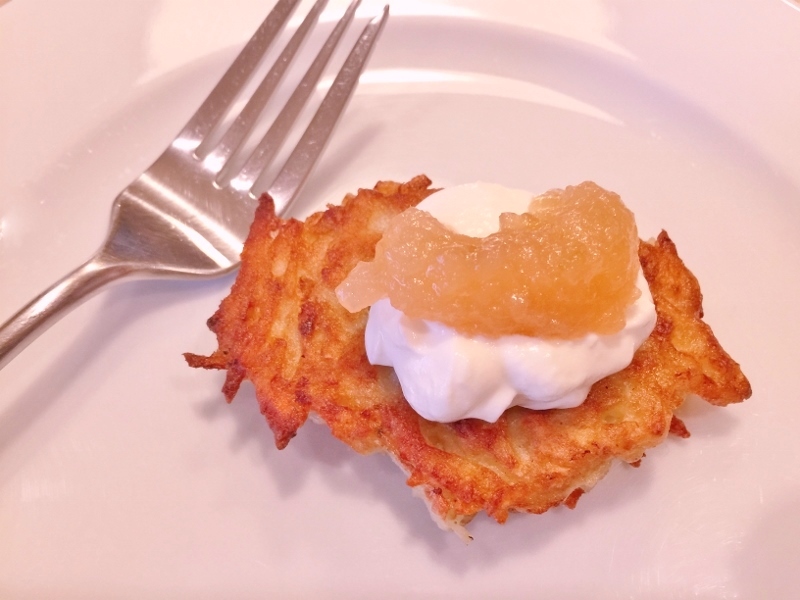 A classic dish of this jew holiday are Latkes – small potato pancakes fried crisp in oil. My husband’s aunt was the first person to show me how to make latkes. 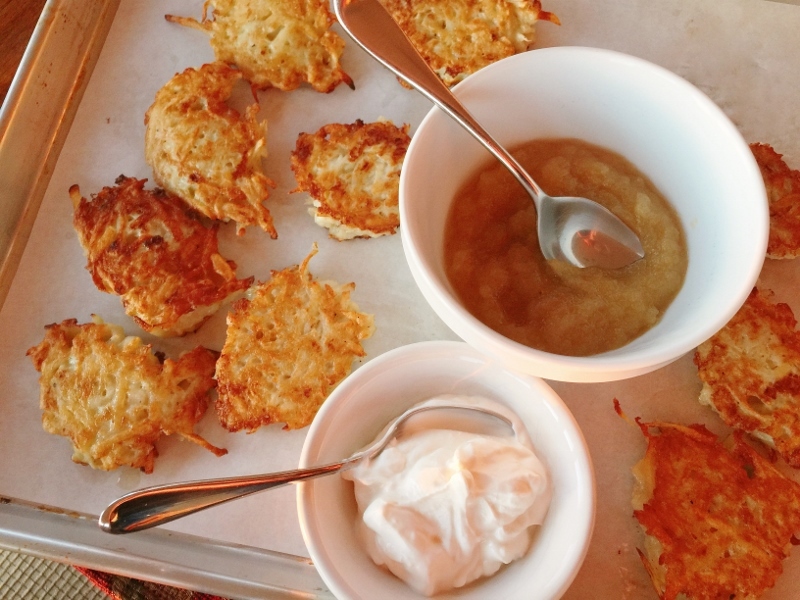 For many years, we celebrated with the family and enjoyed her special latkes topped with homemade apple sauce and sour cream. Even in her mid-nineties she was in the kitchen preparing pans of hot latkes. Her pancakes were made of shredded potatoes and onions and had a nice soft interior that melted in your mouth. The crispy crust topped with fruity puree and a dollop of tangy cream was always the icing on the cake at the party. Latkes are usually made in big batches because it’s a meal to share with loved ones. I thought creating a casual serve-yourself Latke Bar or tray with Homemade Apple Sauce and sour cream would be fun. 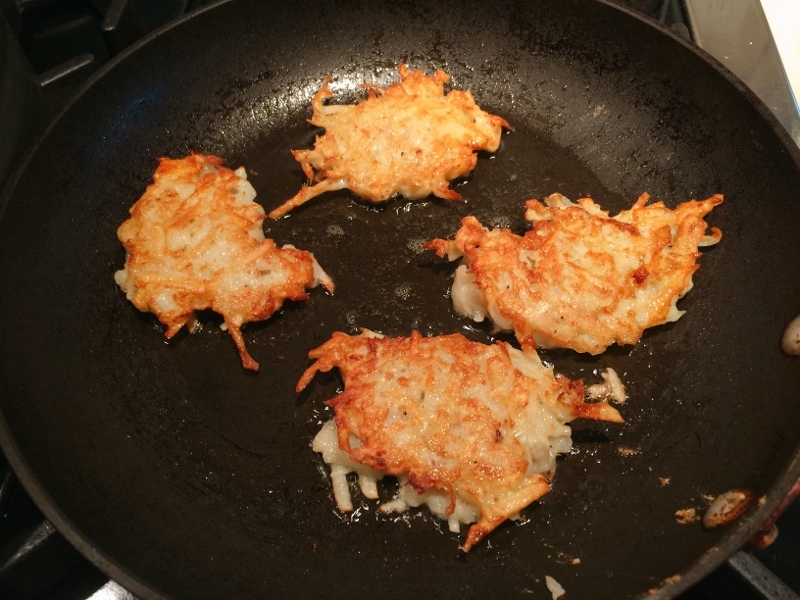 Latkes can be prepared and stored in a low oven, until ready to serve, but if you can snag a hot one straight out of the pan, I highly recommend it. 1. Preheat oven to 250 degrees. Grate potatoes and onion and place in a kitchen towel. Squeeze liquid out of mixture and place in a bowl, along with eggs, flour, salt and pepper. Mix until combined. 2. Add 1/4 cup oil to a skillet and place over medium heat. Dollop potato mixture into small pancakes in pan and cook for 3 minutes on one side. Flip latkes over and cook another 2 minutes, or until golden brown. Place latkes on a parchment lined baking sheet and store in the oven. Repeat with remaining potato mixture. 3. 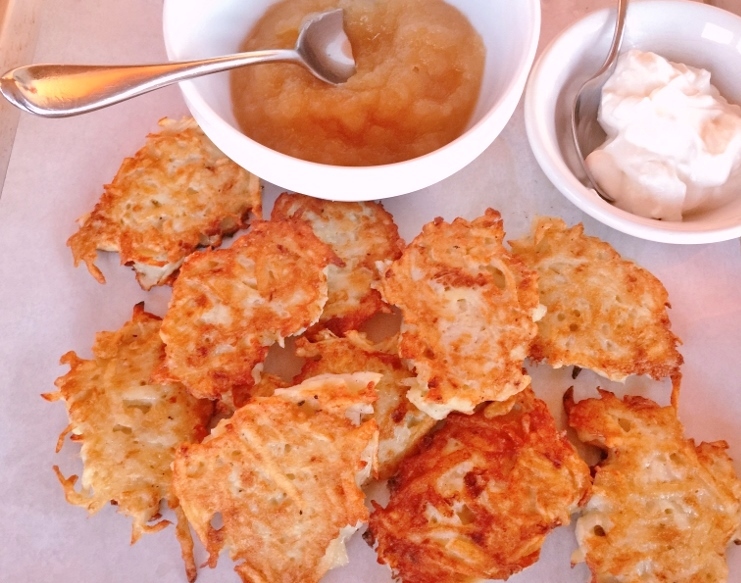 Remove Latkes from oven and place on a tray and serve with bowls of apple sauce and sour cream. Enjoy! 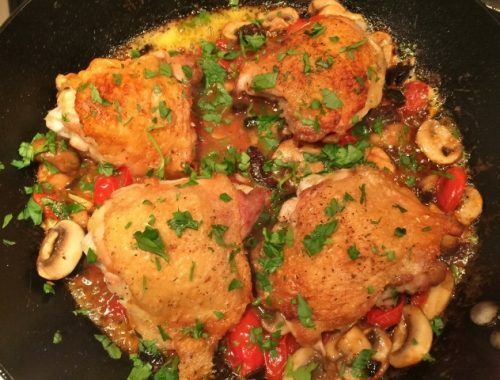 Skillet Mediterranean Chicken – Recipe! 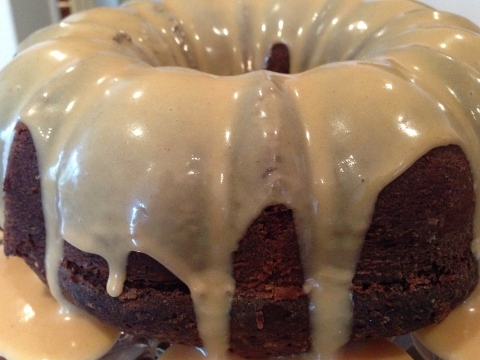 Double Chocolate Peanut Butter Glazed Bundt Cake – Recipe! 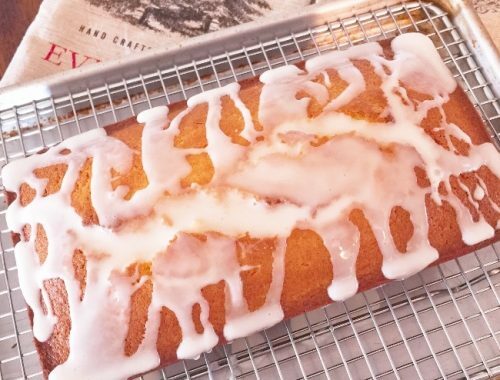 Gluten-Free Eggnog Pound Cake – Recipe!